PES Amazonian is a fast colonizer and quick growing psilocybe cubensis strain. The Amazon magic mushrooms can grow large with thick meaty stems. The caps can be round to flat. First flushes of the Amazonian PES will fruits the most of it's yield. The PES Amazonian grows great on BRF and PFtek substrates. You will see the Amazons dense rope like mycelium that will take over the agar or substrate in little time. One of out favorite mushroom strains! Substrate: Brown Rice Flour, PF Tek and Rye Grain. Also dung and compost. Fact: The Amazonian PES is from Pacific Exotica Spora, Hawaii. The mushroom spore prints are made on sterile foil which is stored in sterile ziplock bag and kept under refrigerated conditions. Each spore print can have a tiny scratch of spores removed from the print. With this swab a test run on agar or liquid culture is made to check the conditions of the spores. Only spores that germinate are released as a print. 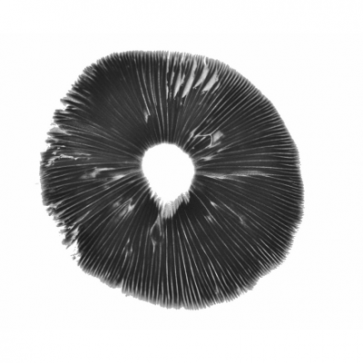 Store the spore print refrigerated between 2*C-8*C Celsius or 35*F-46*F Fahrenheit. A mushroom spore print can be stored for years, whne it is cooled.